'Beast From The East' Brings Beauty, Cold And Chaos To Europe : The Two-Way A cold snap from Siberia is bringing unusually bitter air and snow to much of the continent, stranding motorists, closing airports and killing several people. Palm trees dusted with snow stand in front of the Milan Cathedral during a snowstorm early Thursday, as much of Europe is hit by a Siberian cold snap. Stemming from Siberia then sweeping south to the Mediterranean and west across much of Europe, unusual cold and snow are bringing picturesque vistas — as well as misery and turmoil — this week. Airports have ground to a halt, schools have shut down, and several people have died. In Poland, where temperatures have plunged into negative territory, police reported several deaths from the cold, according to The Associated Press. Some Polish cities have installed heaters in the streets in a bid to help the most vulnerable. And as people throughout the country try to keep warm, power and gas demand are at record highs, says Reuters. Two people have died in Romania, according to Reuters, including an elderly woman found collapsed in the snow. And in Sweden, media said an asylum seeker from Burkina Faso died Thursday after spending the night outside with no shoes on. She was reportedly with her two young children, who are receiving hospital treatment. "From Belarus to Britain," the Red Cross says it is running shelters and providing food, blankets and medical treatment for thousands of people. "We are calling on the public to help us protect people who could be in danger — that could be an elderly neighbour, a young family, someone you know who's ill," said Simon Missiri, the International Federation of Red Cross and Red Crescent Societies regional director for Europe. In Spain, Italy, Germany and Hungary, the Red Cross says volunteers are on street patrols to provide hot drinks and food to the homeless. In Croatia, volunteers are digging out homes buried under snow. And in France, the organization is asking the public to donate thousands of blankets. In Belgium, some officials weren't leaving people the option to stay outside: In Etterbeek, a Brussels neighborhood, Mayor Vincent De Wolf said anybody without overnight shelter would be taken, regardless of consent, to a warming shelter. The snow also has caused chaos for travelers. Dublin Airport partially shut down on Thursday, and officials said it was unlikely there would be flights on Friday. Scotland's main airports also closed Thursday. 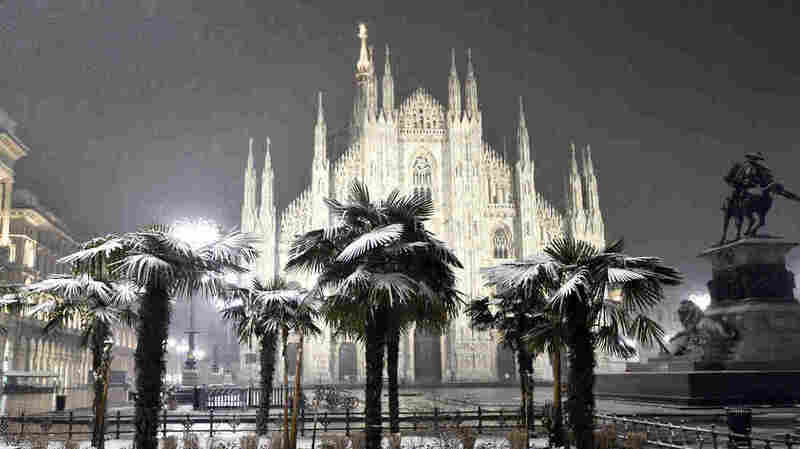 The snow also shut down the international airport in Geneva for a few hours on Thursday. To cheer up beleaguered travelers, the city's official tourism office invited "all passengers waiting for their flight" for free hot chocolate. In the United Kingdom and Ireland, a snowstorm the British weather service has dubbed Emma is bringing blizzard conditions Thursday and Friday. Hundreds of vehicles were stuck on a Scottish road overnight into Thursday, reports the BBC, stranding some motorists for 18 hours. But in some cases, normally busy urban centers hushed by snow inspired awe among residents. A rare snowfall on Monday blanketed Rome, where residents quickly turned to Twitter to share images of the city's ancient ruins blanketed in white. But the Italian Armed Forces had to be called in to help restore order on the capital city's roadways. Some Londoners, who typically enjoy more temperate winters, even broke out the skis to get down the street. Kat on our #StPancrasCRU team has been taking on the #BeastFromTheEast head-on to get to patients through the #snow, & is ready for #StormEmma! Counterintuitively, Europe's cold snap actually derives from warming over the North Pole, according to the World Meteorological Organization. "This warming results from a breakdown of the usual westerly winds and often leads to cold easterly winds coming from Siberia which influence temperatures in Europe," the organization says. Global warming leads to melting ice in the Arctic Ocean, reports Reuters, exposing warmer water underneath, which then sends heat into the atmosphere and may disrupt the jet stream. Europeans looking to escape the cold actually could head to the Arctic, which is experiencing one of its warmest winters on record. As The Washington Post reports, on Sunday the temperature was only 23 degrees in Britain, but 43 degrees in northern Greenland. The cold isn't expected to let up for a while: The UK Met Office says conditions should begin returning to normal by mid-March. A previous version of this story said Etterbeek is outside Brussels. It is part of Brussels.